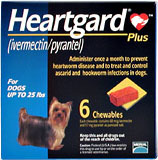 Heartgard Plus is the #1 choice of veterinarians for heartworm disease prevention! Heartgard Plus is 100% effective against heartworms; and it controls roundworms and hookworms. Heartgard Plus is approved for use in puppies as young as 6 weeks of age. It is safe for pregnant or nursing females - stud dogs - collies - and dogs with collie genetics. Heartgard Plus has a wonderful beef flavor - and should be chewed rather than swallowed whole.